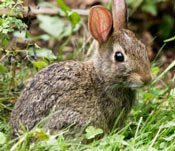 Rabbits may seem like delicate nibblers but that doesn’t mean they don’t do considerable damage.Rabbits will eat the tender growth of newly emerging plants in the spring. During the summer, they will eat broad-leafed weeds, clover, grasses, leaves, shoots, roots, fruit, berries,vegetables. In winter, rabbits will eat bark of trees and shrubs, buds, twigs, blackberry and raspberry canes bushes. Although they can be quite a nuisance, you can get rid of rabbits from your garden. How to recognize the signs of rabbits in your area? Rabbits have a great number of natural predators and they may be difficult to actively observe. However, it's not uncommon to see rabbits in broad daylight when they're in an unthreatening environment and some gardens are simply overrun with rabbits. In addition to observing damage on plants you may see rabbit droppings. Rabbit pellets are about the same size and shape as a pea. They may appear scattered or in small piles. "I love bunnies, well I use too anyway. All of a sudden I have them everywhere and they're eating me out of house and home! My neighbor told me about your rabbit repellent which I immdiately purchased. To put it simply, I haven't lost a plant since I started using it. Excellent!!" How to recognize rabbit damage on plants. Carefully observe the leaves and stalks that have been left behind. Quite often rabbits will nibble plants down to the ground. Because of a rabbits’ sharp front teeth, the leaves that are left will appear cleanly cut as though they were trimmed with scissors. Compare this to the deer damage. Deer tear at leaves, leaving ragged edges. How to recognize rabbit damage on trees and shrubs. In the winter, with the absence of tender, new growth, rabbits are more likely to gnaw on trees, twigs and shrubs. The bark of young trees are particularly susceptible to rabbit damage. As trees mature and the bark thickens, the trees become less desirable. Rabbits may eat the bark on trees from the ground up to around 20". They may gnaw the bark in patches or even completely girdle the tree. Rabbit damage on twigs and shrubs appear as clean cuts at a 45 degree angle. If the damage is above two feet from the ground, it is more likely from a deer. There are many methods, suggestions and home remedies available to control rabbits and get rid of them in your garden. Some methods to keep rabbits from eating your plants are listed below. Preferred methods depend on your lifestyle, finances and personal preferences. "Just wanted to let you know I've tried a lot of these home recipies but nothing compares to your rabbit repellent and it's so much easier to use." When comparing cost, convenience and reliability, you can see why so many gardeners choose I Must Garden Rabbit Repellent! I Must Garden Rabbit Repellent does not smell offensive to people and won’t harm the animals. Rabbits just don’t touch any plants sprayed with it. Make your garden less inviting to rabbits. Add barrier fencing to protect plants. Add collars around the trunk of a young tree to prevent rabbit damage and add a fence around vegetable gardens. Fences must be anywhere from 2-3 feet above the ground and be buried to a depth of six inches underground. In areas where it snows, consideration has to be given to allow for extra height to a fence. Electric fencing is another option. Fencing needs to be strong and regularly checked for damage and be quite costly. In addition, fencing is not always an option from an aesthetic view. Check with local ordinances on trapping guidelines for your area. Trapping can be time consuming and costly. Just the presence of a dog in your yard may be enough to keep rabbits away. However, you may not want to deal with the expense and maintenance of a dog to get rid of rabbits from your garden. Water scarecrows, fake snakes and owls, aluminum pie pans and ultrasonic devices are sometimes used to try to scare rabbits away from plants. Unfortunately, they can be unreliable and have limited effectiveness as rabbits do eventually get used to these devices and are no longer frightened by them. Spray with I Must Garden Rabbit Repellent. A most economical and practical method to repel rabbits from your garden is to spray with I Must Garden Rabbit Repellent. It works and it’s guaranteed. You can quickly and easily protect all your plants from rabbit damage. Spraying your plants with I Must Garden Rabbit Repellent will make your garden less appealing to rabbits and they’ll go elsewhere to look for food and shelter.